The next Light Xbox Live Workout is this Thursday morning. If you would like to participate, you need to email me your gamertag. This is an invitation only match, so I need your gamertag before 6pm Wednesday night so I can add you to the list. I will warm us up with three 2-footer songs, give us time to stretch, and we will cool down with three more 2-footer songs. Sometimes, when I’m exercising, I look at the time left on the machine and think to myself, “Twenty minutes. Less than an episode of Gilligan’s Island.” I don’t know where that phrase came from, but I find that thought in my head often. Logically, it’s a useless phrase. I no longer watch episodes of Gilligan’s Island. I don’t think I could consciously sit through one without wanting to claw my eyes out. I don’t think kids watch Gilligan’s Island anymore. If it shows anywhere, I’m sure it has been relegated to TV Land. Why do I find that phrase inspiring? Why do I tell myself, “Less than an episode of Gilligan’s Island?” When I was a kid, I loved the show and it always felt like it ended far too soon. I realized commercials took up a third of its time, so each episode was really only about twenty minutes. It was motivational to me. Twenty minutes is short. It will fly by quickly. I don’t know why measuring my workouts in Gilligan Time helps speed them along. I don’t even know if thinking that phrase even helps me. I seem to feel better about the time left on the treadmill when I think of it as “less than an episode of Gilligan’s Island,” but I don’t know if I actually perform better when I console myself in that manner. Only recently have I even become aware of this phrase residing in my head. I wonder where it came from. I must have been very young for it to make any sense to me. I wonder if Richard Simmons said it once on his show and it has become permanently lodged in my memory. It doesn’t matter where it came from. All I know is that it is repeated in my mind every time I look at the treadmill and it reads less than twenty minutes and, strangely, it helps me finish up. It’s very rare that I ever start a workout and end it early. Soy Protein: Is it all it says it is? I have heard a lot of claims about soy protein. I have heard that it will lower your cholesterol. I have heard that it will help you through menopause. I have heard that it will lower your risk for heart disease. Are any of these claims true? This article has some details on soy and what the FDA allows. It provides the basic information on what researchers have found out about soy protein and its components. Ediets.com is featuring an article from Harvard Health Publications. It talks about the scientific data supporting (or lack of data, as the case may be) various diets and weight loss aids. Make sure you get all the way down to the section, â€œRating the Weight Loss Supplements.â€ They have a graph showing the proof given for various supplements and food items that have been marketed as weight loss aids. With all the celebrity diets that have been splashed across the magazine covers lately, there is one that has gone completely unnoticed. 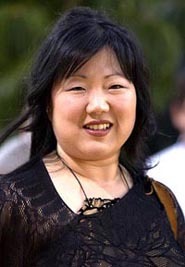 Margaret Cho, a comedienne and activist, wrote a blog entry about her dramatic weight loss over the last year or so. Starting in 2006, the FDA is requiring food companies to provide trans-fatty acids on the nutritional facts. Because of this, the food companies are scrambling to make their food healthier. Rather than truly admit how much hydrogenated oil is between those dark and chocolately Oreo cookies, they are working on a new formula to reduce the fat. Of course, this is going to change the taste of Oreos. Instead of the choice between regular, Double Stuf and generic brands trying to copy their style, there will be a new addition to the group: Trans-Fat Free. That doesnâ€™t mean calorie free. It doesnâ€™t even mean fat free. All it means is that it has a slightly less chance of giving you heart disease and clogging up your brain. On the whole, Iâ€™m happy about it. Even if the trans-fat free version goes the way of New Coke, at least Iâ€™ll know how much trans-fat is in the Double-Stuf version. Itâ€™s the knowledge that is empowering. I canâ€™t wait for 2006. For now, Iâ€™m checking my labels for hydrogenated and partially hydrogenated oil. What made me so happy with the US government’s down to earth advice and recommendations has made this writer angry and frothing at the mouth. I donâ€™t want Uncle Sam to tell me what I can and cannot eat. Itâ€™s my responsibility to make sure that I eat healthy food, not the government. The minute I pass the responsibility over to the government (or anyone else, for that matter) is the minute that I start deluding myself. I am the only one who has the power to put food in my mouth. The food industry isnâ€™t cramming unhealthy food down my throat. They are making food that tastes amazingly good. Itâ€™s my responsibility to eat it in moderation, if at all. I am sponsoring an Xbox Live Workout this Thursday morning. If you would like to participate, you need to email me your gamertag. This is an invitation only match, so I need your gamertag before 6pm Wednesday night so I can add you to the list. â€œThe fastest-growing exercise trendâ€ That phrase seems forced to me. I have memberships to two gyms and Iâ€™ve never seen a kettlebell. Where is this trend growing? After looking at pages and pages of information on the Internet, it seems that much of the hype comes from the website mentioned above: Dragon Door. Iâ€™ll never forget the scene in the book, Thinner Than Thou, in which the teenager on the road, searching for his anorexic sister eats three huge steak meals. He “wins” the free meals and prize money, which helps them survive until they can find her. Afterward, their friend drives along the Interstate Highway disgusted and amazed at what he saw. Once again, I am amazed and disgusted by real life. 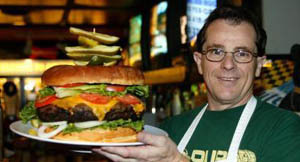 Itâ€™s all over the news, the six-pound Ye Old 96er has been conquered by a 100-pound woman. She ate the whole thing in less than three hours. I feel like I should say something about it, but Iâ€™m sitting at the keyboard, numb.